ALLOYS: Architectural Bronze uses alloy #5052 which offers good cutting welding and corrosion resistance. It is excellent for anodizing, and has a superior hardness rating of H32. BRONZE ALLOYS: Flat Cut Bronze uses alloy C22000 which is comprised of 90% copper and 10% zinc - 0% LEAD. BRASS ALLOYS: Flat Cut Brass letters uses alloy C46400 Naval Brass which is comprised of 60% copper and 39.25% zinc and .75% tin - 0% LEAD. MUNTZ ALLOYS: Muntz metal uses alloy C280 (nearly identical in appearence to brass) which is comprised of 60% copper and 40% zinc - 0% LEAD. COPPER: Flat Cut Copper letters use alloy C11000 which offers good cutting, welding and corrosion resistance. STAINLESS STEEL ALLOY: Flat Cut Steel uses alloy C304 which offers good cutting, welding and corrosion resistance. Note: All stainless steel letters and logos are shipped without clear polyurethane coating. Alloy C304 will not tarnish under almost any condition. However, like all flat cut metals products, if exposed to rain, sprinkler systems or other high moisture areas, mineral buildup may occur on the surface of the letters or logos. Using harsh chemicals may cause permanent damage to the material's surface. Architectural Bronze recommends warm soapy water. Architectural Bronze's Waterjet Cut Hot Rolled Steel is the ideal material for a rustic or antique look. Exceedingly durable, you can choose either Natural (with some rust) or Flat Black finishes. Your custom design or standard letters can be produced for you. 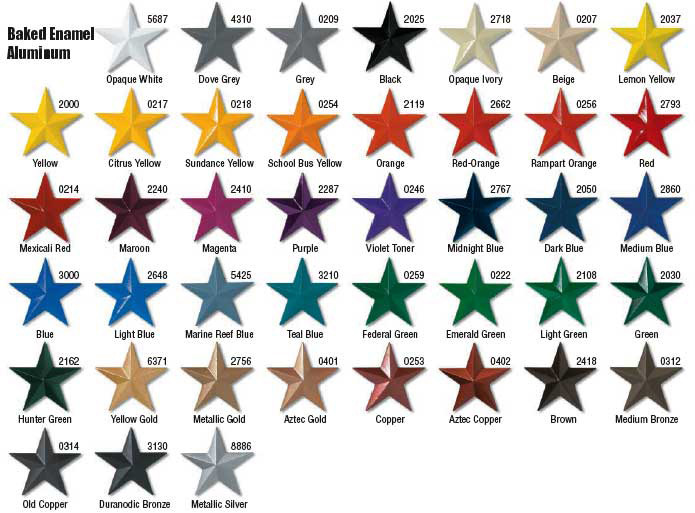 *Architectural Bronze also offers metalic automobile colors by companies such as PPG, Sherwin Williams and Benjamin Moore. Add $40 Net matching fee per color, additional paint charge will apply. Due to limitations in the printing process, printed colors can vary from actual colors.